I arrived at Frankfurt airport on 5 July after 18 hours of flight travel (including transit) to meet up with a friend who is traveling with me. I am so thankful to be able to have a shower at a Frankfurt hotel and had lunch before boarding my train at 1pm from Frankfurt to Lobau with a transit at Dresden. By the time we arrived at Lobau, it was 7.30pm. The ride to YWAM Herrnhut castle, where we are staying, was about 15min but we stopped by the supermarket to get some bottled water and small bites. It took me 28 hours from the time I boarded my first flight to arrived at Herrnhut! As you might have guessed, I completely crashed out that night! YWAM Herrnhut Castle with a dry moat surrounding it. I have longed to be in Herrnhut for many years, drawn by the Moravian history of a century long continuous prayer virgil and from which birthed the first Protestant mission sending force. I have heard friends who have been to Herrnhut describing the place as thin, referring to the distance between heaven and earth. Besides having open heavens it is also a very deep well where the Moravian church had dug the wells of living waters continously for a century. The first place we went on 6 July Saturday morning is the woods right next to the YWAM castle. Once I stepped into the woods, my spirit felt an immediate refreshment by the tangible divine presence of the Holy Spirit. In the woods, there are many hidden spots of spiritual significance. We first headed to the monument commenerating the first tree chopped by Christian David to clear the land for the building of Herrnhut village. The name of the village Herrnhut literally means “The House of the Lord”. As true as what its name implies, God has made his abode in Herrnhut exemplified by its history through the devotion of the Moravians. 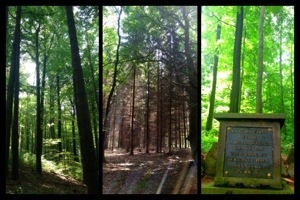 The woods behind YWAM Herrnhut Castle. The monument where the first tree was chopped by Christian David to clear the land for the building of Herrnhut village. One of the signicant places in Herrnhut is the Watch Tower. The Moravians spent a big portion of their time keeping watch in prayer over Herrnhut and Berthelsdorf (the village where Zinzendorf lived), both spiritually and physically. The Watch Tower is strategically positioned at place whereby it can see both villages. Before reaching the Watch Tower, there is a cemetery dedicated to the Moravians. This cemetery does not have the usual creepy-eerie feel. There is a deep sense of peace that all these saints are resting in the arms of our Lord Jesus. The tombstone of Zinzendorf and his wife, Christian David and also the famous missionaries Leonhard Dober and David Nitschmann, who sold themselves as slaves to St Thomas island to preach the Gospel to the slaves who had never heard of the Gospel, together with many nameless, faceless Moravian heroes of faith are found in this Moravian cemetery. Here’s a link with tells of Christian David and Daivd Nitschmann story, including worship song video, if you want to know more http://timschaaf.wordpress.com/tag/johann-leonhard-dober/. The Watch Tower gives a 360 view of Herrnhut. Rolling meadows, pretty houses and the woods give a breathtaking view of this small, quaint village that God chose to pour out Himself so mightily. 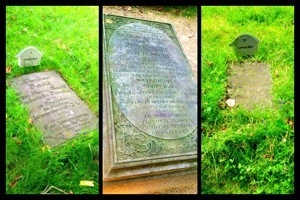 The tombstones of David Christian, Zinzendorf and Leonhard Dober at the Moravians Cemetery. The Sunday afternoon was such a beautiful weather that we took a walk to Berthelsdorf. 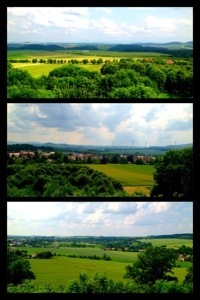 It is about 4-5km walk from Herrnhut town. The castle of Count Zinzendorf was not opened so we basically looked at it from the outside. Following which, we went to the original church building of the Moravians when the Moravian church started. By the time we got there, the church santuary was locked. It was a Sunday mid-afternoon when everyone was back home. We believed it was God’s purpose so that we did not get distracted by the interior of the church santuary. The gate into the church compound was not locked. Instead we wandered into the garden of the church (many tombstones as well) and was drawn to a fountain. Before arriving at the church, we ran out of water and was extremely thirsty and there was no shops or stops whereby we can buy water. The fountain looked so inviting and we felt that we needed to drink it even though we are not totally sure if the water was potable. We said our prayers and drank from it. The water was so fresh and sweet! In the natural we were quenching our physical thirst, but in the spiritual God is quenching our spiritual thirst at this place of deep well where the Moravians had dug deep. We sat at the bench next to the fountain and worshiped, soaking in His presence! Berthelsdorf Moravian Church and its garden with a fountain of refreshing spring water.